When we first started HurryTheFoodUp waaaaay back in the day (last year) we made a simple mantra we wanted to follow. Our recipes had to be quick, tasty, healthy and meat-free. So far, so good. But other, less obvious, points were hidden from us at that time. Some were easy – all three of us naturally stayed away from recipes that included little known, or hard to find spices or herbs that would get used once then sit abandoned and forlorn in the cupboard, never to see the light of day again. Wasting food is one of the western world’s biggest problems (one of I said!) and there’s no way we were going to add to that. 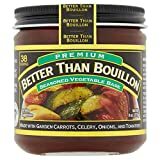 So when Howie said he still had a half jar of baby corn and a half pack of snow peas sitting in the fridge with nowhere to go, he’d made a valid point. After all, he’d already made a big batch of the curry, for photographing, for eating, for force-feeding to housemates. So what to do with the rest? Maybe we could make them optional ingredients, he suggested, and focus on the frozen veg instead? No no, came the adamant response from Kat – these ingredients are an integral part of the meal. What’s a green Thai curry without the sweet crunch of a baby corn, or the tender bite of a snow pea? It’s just not the same. Which meant we had to find another way. Indeed, it’s nearly impossible to make only recipes that use an exact amount of buyable ingredients (a market might help to combat this, but if you’re relying on supermarkets like we are then it’s pretty much a no-go). So what to do? We put our heads together and here are some of the best options we came up with to avoid wasting food. Make huge batches and eat them for days. 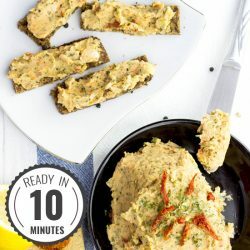 You’ll certainly use up your ingredients, but run the risk of putting yourself off the meal for good (see last week’s White Bean Dip for an example). Make huge batches but freeze the leftovers instead. This saves masses of time and means you’ll always have a tasty meal just waiting to be reheated when you have little energy or time to cook. It’s very efficient with the only drawback being that not every dish is freezable. You’ll be happy to hear this curry is perfectly suitable for freezing. Find other recipes that use the same, or replaceable ingredients. This was the option that Howie plumped for in the end, and he made this deliciousFake Lo Mein and ensured not a single pea was thrown away. Are you guilty of wasting food? Do you use any of the methods above? Which work best for you? Do you have any more tips or advice to help combat the millions upon millions of tons of good food thrown away every year? Ready in 30 minutes and packed full of taste, spice and a fresh lime kick. Delicious, nutritious and it's even vegan, yaay. Peel and dice the onion and ginger and fry them in oil in a frying pan on medium heat for a couple of minutes. Add the frozen vegetables and give them a few minutes to cook. In the meantime wash the snow peas and cut them and the baby corn into small chunks and add them to the other vegetables in the pan. Add the curry paste, maple syrup and salt to taste and let it cook for another 5 minutes. Finally add the nuts in the last minutes of cooking so they are still crunchy. I like my curry with basmati rice or naan bread but you can also serve it with noodles or just on its own. You should prepare the side dish as everything is simmering - you’ll save time that way. IF YOU LIKED THIS RECIPE: Surely you have some left-over veggies after prepping this dish? Use it for this awesome Vegan Lo Mein! 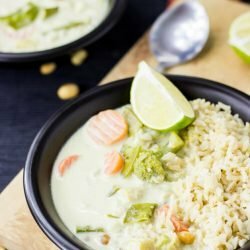 Thai green curry is my absolute favourite thing to eat! This recipe looks delicious and so creamy. I’ll definitely have to try this! Ah, it’s sooo good! I have to give Kat all credit for this one. Pretty awesome show! I love Thai curries. This looks so creamy and delicious! Great post! I love the recipe and the ideas behind it!! I think it’s so important to not waste food. And I love that not only are you NOT wasting food, but you’re making fabulous recipes from there. 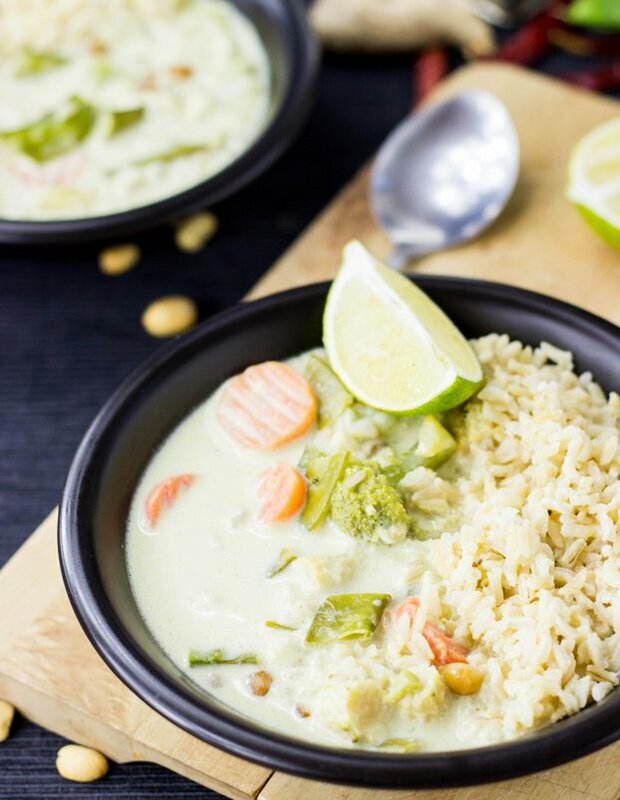 Can’t wait to try this delicious looking thai green curry! Such a colorful dish and I love that it’s filled with veggies! Thai and Mexican food are on the menu weekly in my house. I can’t wait to try this recipe! I love to make different recipe from a main ingredient. Love you recipe! I used to have that same problem with leftover food, but now I do what you guys have as number 1! I will make 3 to 4 of the same lunches for the week which will have used up all the groceries. Best way to do it! 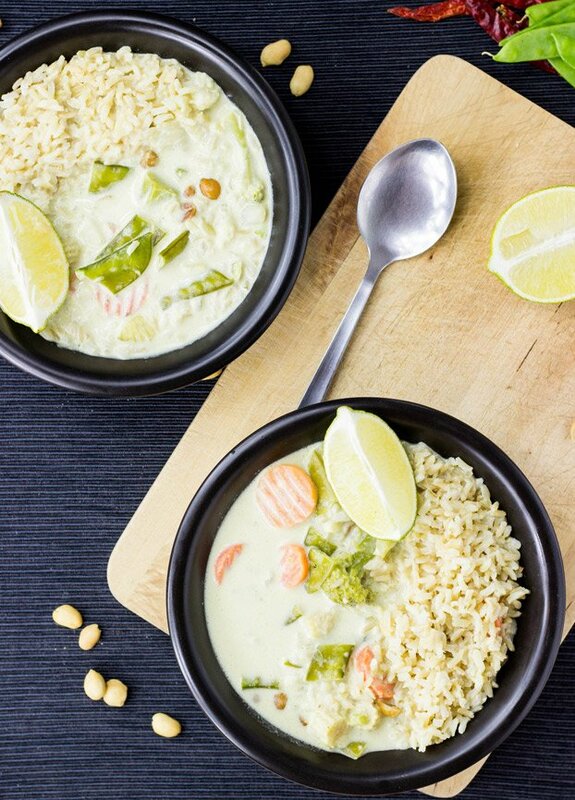 This thai curry looks delicious – also love the sauce to rice ratio. mmm!! 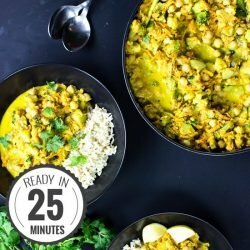 One amazing looking curry and lovely to know that how easily and quickly it can be prepared! Being Indian, I am very much in love with curries. This looks so delicious. Once a week collect give the leftover food to the poor or homeless in your downtown. They will love you for it. Of course, that’s a great idea too!! Only discovered your site yesterday, very late to join the party, but feeling inspired to dance around my kitchen again. Well done all of you for sharing your passion, thoughts and wonderful recipes. I kind of made a cross-over Easy Cauliflower- and Thai Green Curry yesterday, because my already-in-the-fridge-too-lazy-to-go-to-the-supermarket-ingredients couldn’t cater for either recipe. Ha ha. It worked like a charm though. Very tasty and I’ll be having the left-overs pretty soon. Ooh, half way through my meal yesterday I thought that some toasted flaked almonds would be a great addition (didn’t have any peanuts or cahews). So I toasted some. YUM-MIE. Just saying. The curry cross-over sounds great, you’ve probably noticed from my writings that I love anything/everything curry-related! That all really sounds good to me – I’ve got a list of recipes I need to try freezing to see if they work – I hope they do! It definitely makes things easier. And yes, tweaking recipes – absolutely! Some real hidden gems can be found that way too. Thanks for writing Marlies! 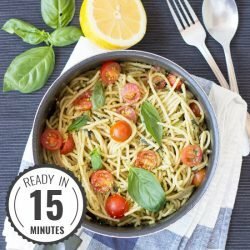 My whole family loves this recipe! Thanks, it’s now one of our favourites. Great recipe! Substituted honey for maple syrup and olive oil for vegetable oil as well as adding a few other veggies to the mix. Very easy to make and will definitely do so again! Sounds great, Steph! Half the fun is trying your own ingredients in a good recipe. Glad you enjoyed! I often freeze leftovers if there’s enough for a meal. Otherwise, I share our meals with an elderly neighbour on one side and our lovely neighbours on the other side of us. Nice way to build community and eat well. This curry looks like one we’ll share! Wouldn’t it be healthier to make the green paste at home? It would cut salt big time.